Hi Creative Home readers! Do your summer days feel long having the littles home all day? After morning chores are done, I immediately hear from my kids “I’m bored, Mom!” So I came up with these summer boredom busters using popsicle sticks! 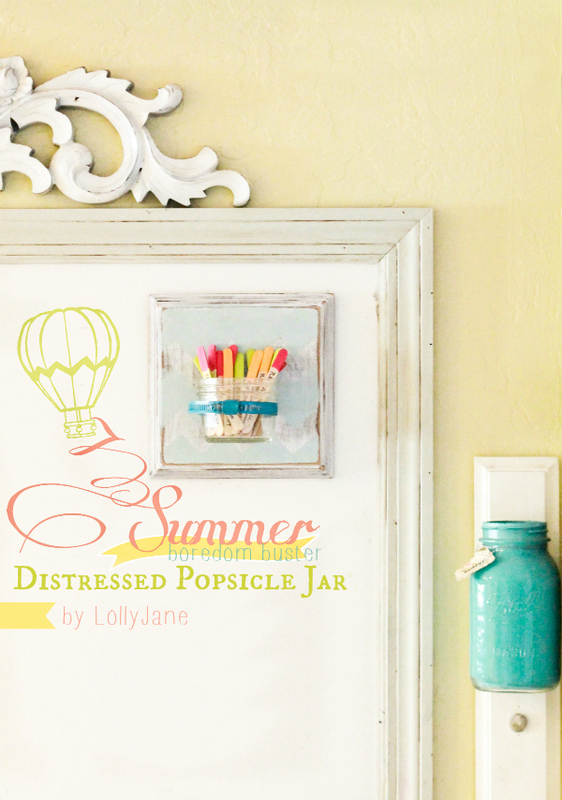 Not only are they fun ideas, it’s an easy afternoon project that the kids can help with. The best part is choosing the activities together! Simply dip your sticks in the paint and let air dry. You can stop here and still have cute boredom busters for your kiddos to pull…or you can hang it near your command station like I did for easy access. And it’s up high so little hands can’t bump the glass. If you’d like to hang it, we copied our mason jar bathroom storage technique, very easy and our only cost was $1.47 for the clamp. We cut a piece of wood down to 8″ x 8″ and routered the edges. (You can also purchase a plaque from your local hobby store, use your 40% off coupon!) Paint the board brown (so it will show through in the end) then paint it white. 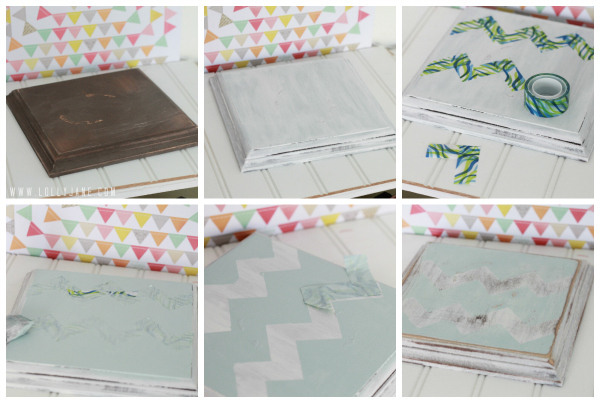 For easy chevron, we used Scotch tape and free handed 2 rows to give it a quick design. Peel off the tape and admire your new pattern. If you like it grunged up like we do, go crazy with your sander! These AC clamps can be found in the hardware department at your local home improvement store. 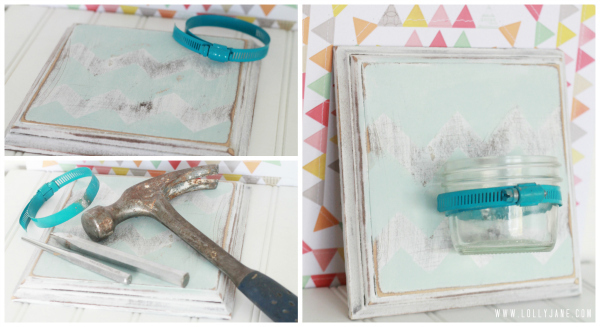 I spray painted mine turquoise to give it a pop of color so it wasn’t as industrial looking. I then used these punches and hammered a hole through the back of the clamp. Warning: you’ll definitely exercise some arm muscle (; Screw your clamp into the wood and you have a very secure mason jar holder! 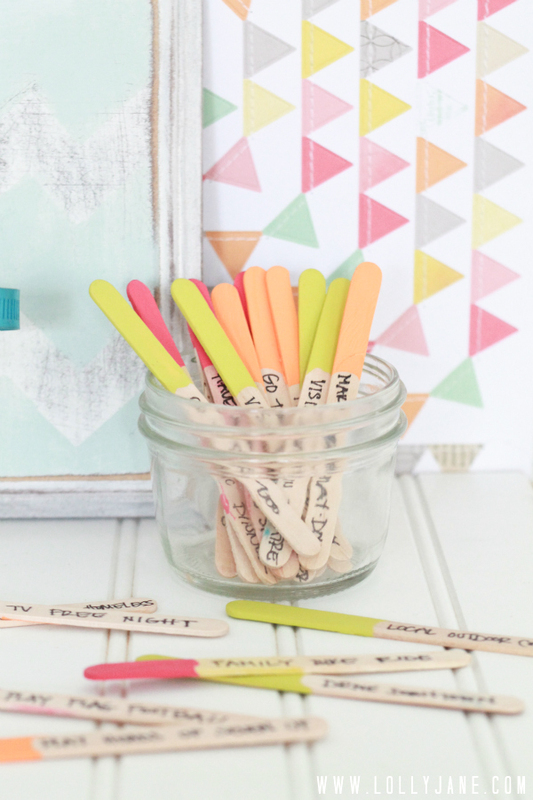 Fill your jar with your custom popsicle stick activities and avoid that oh so common “Mom? I’m bored” struggle! This can also be used as a chore chart, reward system, etc. Who isn’t motivated by pretty colors? (: If you’re looking for ideas, we shared 100 family time ideas last year, which is where we pulled inspiration for these sticks!